My geared stock market portfolio declined by almost 10% last month, and the estimated valuation of our home also declined slightly. The value of my retirement savings increased somewhat. 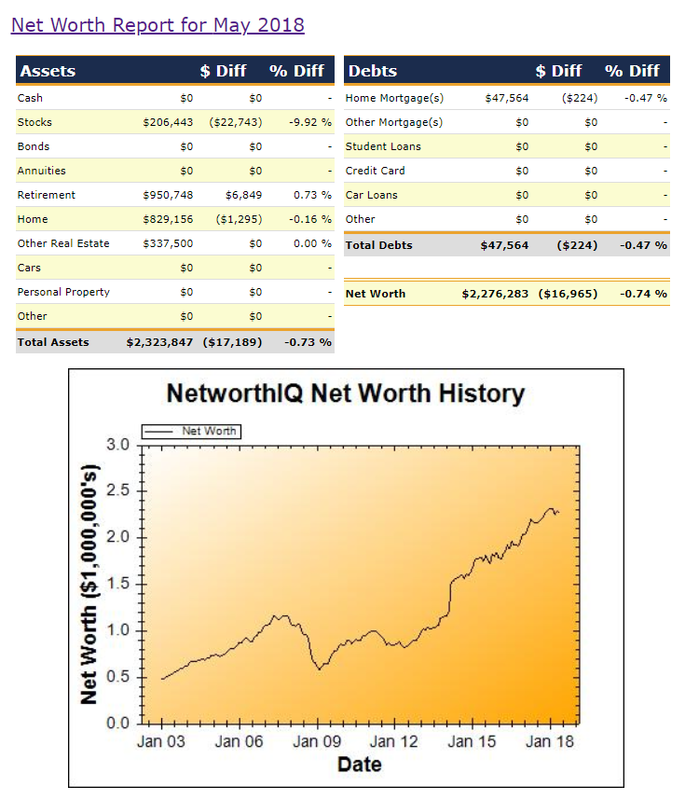 Overall my net worth decreased by $16,965 (0.74%) during May. I've started doing some UberEats deliveries in the evenings as I quite enjoy driving around our local area and I can make around $25/hr gross during the peak 6pm-8pm period. Petrol costs will consume around 20% of the proceeds, but on the other hand it will mean that a portion of my existing car expenses (registration, insurance, servicing) will be tax deductible. Depending on how many evenings a week I feel like doing UberEats deliveries, I could earn around $10,000 pa, which I intend to add to my retirement savings as an 'undeducted contribution'. I also decided to sell off all my individual stock holdings (held within my CommSec and Leveraged Equities margin loan accounts) this week. After paying off my margin loans (and paying any capital gains tax liability) I'll also invest most of the proceeds into my superannuation account. The trigger for deciding to sell off my shares at this time was the possibility that Labor may win the next Federal election, in which case their proposed changes to the treatment of long-term capital gains might have significantly increased the amount of tax payable. DS1 turned 18 recently, so I've added him as a trustee and member of our SMSF. Adding his details using the eSuperfund portal was very quick and easy, but resulted in being sent a 103-page pdf file to printout, sign in about 20+ places (all three of us), and also get some identification documents for DS1 certified by JP... Once the paperwork has all been finalised, DS1 will be able to roll-over his existing superannuation account balance (with a retail fund manager) into our SMSF.